While I am writing this, the midnight has already passed, and today is July 28th, 2013 (Sunday). To a lot of people, today is a day of hope because they can go and cast their votes for the leaders they have a strong conviction that will change the future of Cambodia and rescue the next generations in Cambodia. Every 5 years, Cambodians vote for the top leaders, so a new government has a 5 year mandate. For the record, there are 123 seats to the national assembly and 62 seats are needed for a majority (for a winning party to win and rule the country). This Wikipedia article gives some good basic information about the Cambodian general elections 2013. From 1993, 1998, 2003, 2008, Cambodia saw many competing political parties in the general elections, but exceptionally this year has seen only 8 parties, and the National Election Committee has registered more than 9 million voters. Since earlier this year, so much has happened in preparation for just one day, today. I really mean it when I said all these happenings have caused a lot of headache, concern and distress among Cambodians as well as international communities. But, everything that’s been happening will surely have a direct impact on Cambodians that live here. Here are things that have recently happened and caught everyone’s attention till now. 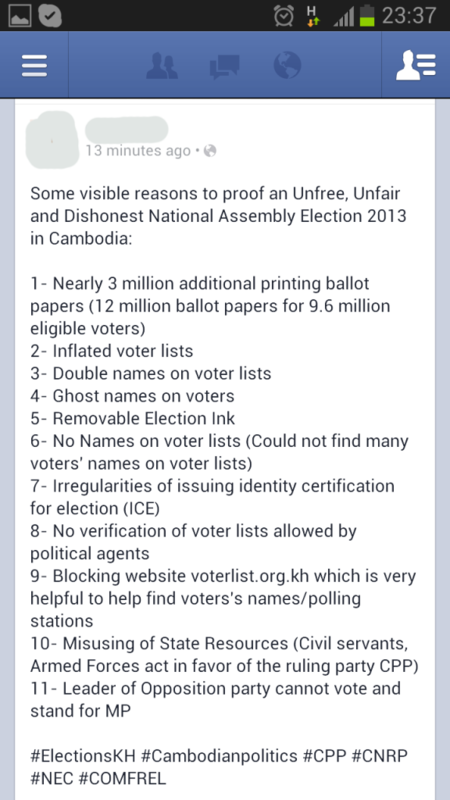 Facebook has been considered as one of the most powerful tools played in Cambodian politics these days. It connects Cambodians from around Cambodia and with other people in other countries. It was earlier a place where young people went to seek entertainment and dating, but that is not the case anymore. A small potion of our economy is also running there. For example, big companies with brands are running their campaigns on Facebook. 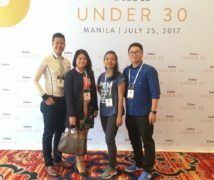 Non-government organizations show off their mission and vision to get support and seek more help. Individuals look for business and study opportunities, fame, fans and attention from other Facebookers who could easily relate to and sympathize with them. At the same time, more videos and information related to crimes, traffic accidents, social injustice such as land eviction/grabbing and countless other cruel acts have been tirelessly shared among circles of friends and friends of friends. It was reported that some people who usually watched TV for news have switched to Facebook to get unbiased and more reliable news. When late King Father passed away in October last year, many people took to Facebook to grieve for him. I was one of the people who witnessed so much love from his fans and some constructive analysis over his past achievements and legacy. Everything went back to normal. Some random news related to traffic accidents and social injustice were posted, and young people and Facebook were kept busy. 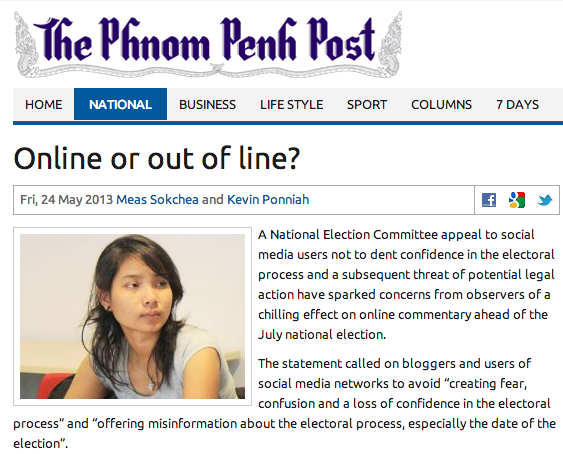 And, then i was contacted by a Phnom Penh Post reporter about a statement that NEC released in late May. which asked social media users not to spread rumors or inaccurate information. The story was printed with quite a big picture of myself. On May 21st, Surya Subedi, a United Naitons Human Rights envoy was ambushed while he was giving a lecture at Cambodia Mekong University. Earlier, he published a report that said Cambodia’s human rights situation was not good. Many people said that the coordinated student group was led by CCP youth, and the leader of the group had been harrassed by other young Cambodians on Facebook for some time. What surprised me the most at that time was that some young labourers in South Korea and other youths in Cambodia shot videos of themselves, expressed their thoughts about one of the group members, and posted them on Facebook. It was the first time that they no longer cared about fear or privacy and decided to show their face and opinions. Sam Rainsy, the exiled leader of the newly established party (merge between SRP and HRP), started travelling to countries where Cambodian labourers stay to get their support, for example South Korea. But he couldn’t return to Cambodia because he would be facing charges over the demarcation issue. He left Cambodia since 2010. Suddenly in earlier June, the 12-member national assembly permanent committee, made up entirely of Cambodian People’s Party lawmakers, made up their mind to strip 27 opposition lawmakers from the Sam Rainsy and Human Rights Party of their parliamentary status and salaries. That one single event surely meant disrespecting the voices and decisions of the people, as they were elected by people. However, legally when representatives resigned from their previous political party, in this case, the Sam Rainsy Party and moved to a new party (CNRP), the National Assembly, as some experts say, had the right to remove them currently before they came back to the National Assembly. On the same day, the United States released a statement to condemn the act by the permanent committee, saying it was “very undemocratic” to lift the MP’s legal immunity. The 30-day campaign started in late June and should finish on July 26th. I have observed many people analysing certain political parties’ policies. There’s good and bad stuff about each and every one party listed (8 parties in total). I mentioned “good and bad stuff” seeing that CNRP have used CPP’s shortcomings to draw on supporters. CNRP called on people to look at illegal immigrants, corruption, poverty, land grabbing and other social issues Cambodia has confronted and been tormented with. However, CNRP was heavily criticized for its much strongly-focused point on Yuon or Vietnamese immigrants in the country, because it doesn’t seem to target only Vietnamese but also foreigners. Shortly after that, Sam Rainsy and Kem Sokha corrected themselves on RFA saying that the country would have to enforce immigration law. The issue encouraged a blogger to write a blog post about the hatred issue between Cambodia and Vietnam. Though I guess that CNRP scored a lot using this point, I myself disagree with the brewing storm of hatred toward others just because your leaders are incompetent to cope with the current problems. 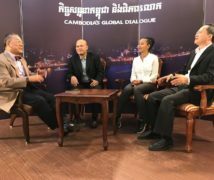 Whereas, CPP emphasized the victory it brought over the Khmer Rouge regime and made itself appear as the main “rescuer” of this nation and pointed out the developments that it has made over the past few years. Hun Sen who became PM since 1985 has been considered as one of the longest-serving prime ministers in the world, having been in power through various coalitions. Because I had to work and had less interaction with other young people, I took the chance to observe this on Facebook. It shouldn’t be any surprise these days for one person to be able to do many things on Facebook. Literally and figuratively, my jaw dropped when I first spotted a long rally of two political parties, CPP and CNRP. Other parties also excitedly began their 30-day election campaign in the same style and manner, but I didn’t follow them much as I believe the whole population are watching the two parties. Where did all these young people come from? Why didn’t I see them before? Why didn’t this happen back in 2003? What triggered them to come out in public to support their parties? I was interviewed on VOA, RFA and recently CNC TV station to discuss the pros and cons of Facebook/social media and its sole impact on the elections in early July. Loads of people asked me these questions. One would say: it could be the land grabs, the much seen social injustice and instability, the corruption, the poverty that we live with every day. Maybe, they’ve decided enough was enough. A Facebook friend posted this on July 27th. Not that I’m sure how many people out of the 80% of the whole population residing in the countryside are aware of all these that have been reported by some media and elections monitors. As of this moment, many young people have wanted to demand the Indian embassy (on behalf of the Indian government) to explain why/how Comfrel, an independent elections observer NGO, could wash off the ink from their finger within 5 minutes. Here’s a video to that. In July, India donated more than 400,000 bottles of indelible ink to Cambodia, and this is not the first time at all. India has kindly donated it since 1998, and Cambodia is only one of the countries that this largest democratic country has helped. Questions are “what’s in it for India?” It is obvious that India has more than just its reputation to lose when it gets accused of sabotage in this manner. It’s also funny when we are willing to doubt the integrity of a sovereign nation and accuse the world’s largest democracy of sabotage but not question why this happened the day before the elections. NEC only promised to closely inspect voters’ fingers for signs of ink on the day. Many believe that the ghost names or duplicate names (around 1 million) would be made easier to happen because of the faulty link. Online, I chatted with a guy who said that he saw his duplicate name near his village. Cambodian politics isn’t like Games of Thrones. There are always speculations in every political game. Some say that if the new party were to be elected, there would be a civil war because people have bare arms while the soldiers on their side are fully armed. Honestly, I haven’t seen much violence taking place this year. It is definitely much improvement from the previous elections. The young sentiments that I have seen, however, show that young voices can’t be ignored anymore, and that from now on, people will take every step any government makes more seriously than ever through various ways such as Facebook and public protests.